Veterans returning home after World War II received a big helping hand from American taxpayers. 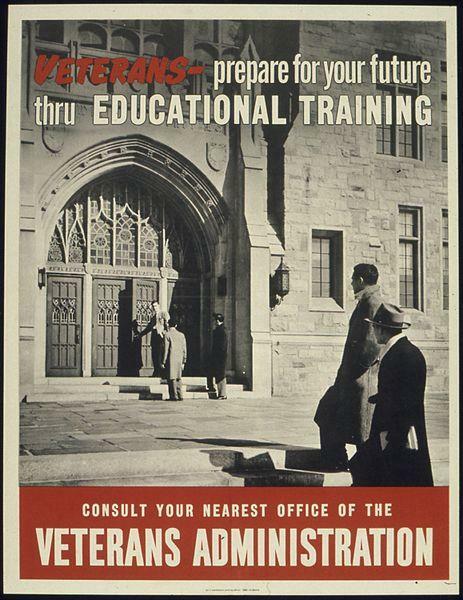 The GI Bill helped millions get a college education. Credit Office for Emergency Management. Office of War Information. Domestic Operations Branch. Bureau of Special Services. Today, veterans returning home from the wars in Iraq and Afghanistan also get help paying for college. The Post 9/11 GI Bill can pay up to around $20,000 a year in taxpayer-funded college tuition. It’s a lot of money, and it’s designed to help veterans get ahead in life, but not all veterans who use the GI Bill are getting a good education. Critics argue that for-profit colleges see a big payday in getting veterans to spend their GI Bill on them. Aaron Glantz with the Center for Investigative Reporting has been following how for-profit, online colleges, like the University of Phoenix, target veterans for their GI Bill funds. Glantz found that eight of the top 10 schools receiving GI Bill money in the U.S. are for-profit schools - not public or private institutions - like Hillsdale or Kalamazoo College - they're schools like the University of Phoenix, Ashford, DeVry, or ITT Tech. "If you look at Michigan, you see that these for-profit schools, and especially Phoenix, are out-competing all of your public institutions for this money." "If you look at Michigan, you see that these for-profit schools, and especially Phoenix, are out-competing all of your public institutions for this money," says Glantz. He says the University of Michigan and Western Michigan University get the most GI Bill money out of the public institutions in the state. "Each of these schools is getting a couple of hundred Iraq and Afghanistan veterans attending, and $10-$20 million in our money," says Glantz. "Contrast that to these large, publicly traded, online companies that are getting more than a billion dollars of your money, and you can see that your public institutions are not reaching as many veterans as they could." Jennifer White talks to Aaron Glantz about how for-profit schools are benefiting from the G.I. Bill. Glantz also offered some advice on how veterans should go about evaluating where to spend their money and on what some veterans think of the education they received through these for-profit schools.